Marsha P. Johnson was an African-American transgender activist and a popular figure in New York City’s gay scene from the 1960s to the 1990s. One of the city’s oldest and best known “drag queens”, (which is what Marsha proudly reffered to herself as) Marsha sometimes worked as a waitress, but usually she worked the streets. She was known for helping other transvestites and street people and was regarded as one of NYC’s original drag mothers. 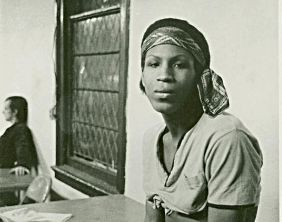 Marsha participated in clashes with the police amid the Stonewall Riots along with her friend Sylvia Rivera and both became co-founders, of the Street Transvestite Action Revolutionaries (S.T.A.R.) in the early 1970s. Marsha and Sylvia became the mothers of S.T.A.R House and together gathered food and clothing to help support the young queens living in the house on the streets of the lower East Side of New York. Marsha was one of a kind. Once, appearing in a court the judge asked Marsha, “What does the ‘P’ stand for?”, Johnson gave her customary response “Pay it No Mind.” and the judge laughed and let her go. This phrase became her trademark. In 1974 Marsha P. Johnson was photographed by famed artist Andy Warhol, as part of a “ladies and gentlemen” series of polaroids featuring drag queens. In July of 1992 that came to an abrupt end when Marsha’s body was found floating in the Hudson River off the West Village Piers shortly after the 1992 Pride March. Police ruled the death a suicide. Johnson friends and supporters said she was not suicidal, and a people’s postering campaign later declared that Johnson had earlier been harassed near the spot where her body was found. Attempts to get the police to investigate the cause of death were unsuccessful but many today believe that Marsha was murdered. Marsha P. Johnson was an original, an activist, and a martyr. The picture on this entry is a photo of Sylvester, not Ms. Johnson.